Star Wars Eye Found It! Games promise time spent together, fun and relaxation. After all, what could be more fun than spending time doing something with people you like? Over the years, Ravensburger has built up a terrific portfolio of lots of different games and highly innovative types of play. 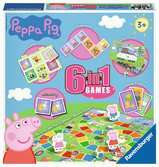 They include all kinds of children's games, family games, adult games, card games and learning games. All Ravensburger Games have one thing in common: the contents and materials are of the very best quality. They are educationally valuable, and contain no violence.